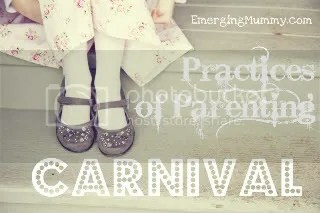 Today, I am blogging as part of the “Practices of Parenting Carnival” held by Sarah Bessey at Emerging Mummy. Even though Kingdom Civics is not a “mom blog,” I do view my parenting as one of my most important roles in God’s Kingdom. Thus, when Sarah asked us to share one of our practices of parenting that makes the experience enjoyable, I couldn’t resist. Enjoy! I have long held the belief that a child’s bedtime should serve the same psychological purpose as the last five minutes of a Full House episode. …Well, I think there is a time that real life should work that way, and that time is bedtime. No matter what craziness, chaos, heartache, or drama happens during the day, I want my children’s last thoughts at night to be that they are loved dearly, that they have people in their corner, and that everything is going to be alright. Life can be tough on children, and we parents can’t always kiss all that pain away. However, I have found that pouring in peace and comfort at the end of a day is invaluable for children. In fact, I know that it is invaluable. I know because that happy, affirming bedtime was my bedtime as a child. Most of my childhood bedtime memories are all a blur of Bible stories and pleas for “just one more” chapter of whatever book we were reading, mixed in with hugs, kisses, rubbing noses, and “I love you more’s.” But there are a couple of bedtime memories that really stand out to me, times when my life was filled with fear and disappointment…only to be redeemed at bedtime. Both memories happened within the same general age range, somewhere between 10 and 11. I know because of the house we were living at, and because I no longer slept in my brother’s room on his top bunk. Instead, I slept in my pink explosion of a room, snugly under my ruffly comforter. I know I was at least ten for the first memory because I had been baptized….and a dreadful realization had come upon me. I realized that I did not love God. Or, at least, I didn’t know if I did. I did know that I loved my parents and my brother, and that my love for God did not compare with the feelings I had for them. This thought absolutely wrecked me. I really wanted to love God, but I didn’t know how to make myself feel the same way about Him that I did about my family. And clearly, this lack of warm fuzzy love feelings meant that I wasn’t going to go heaven. After all, how could one go to heaven without loving God?? My lack of “feelings” for God left me completely despondent. What kind of person was I, who didn’t love God?? And more importantly, how could I ever confess this dark truth to my parents, who thought the world of me? Man…it’s tough being a kid sometimes. Thankfully, my mom knew that something was wrong, and it didn’t take much prying on her part before I burst into tears one night at bedtime. In between sobs, I told her, “I don’t think…I’m going…to heaven.” Startled, she asked why not. “Because I don’t love God!” I wailed. Of course, by this time she was completely taken aback, but I remember that she gently tried to console me with the thought that, of course I loved God. I tried to explain everything to her how I loved my family so much, and how I just didn’t think I loved God as much as I loved my family. And everyone knows you are supposed to love God more than you love anyone or anything else. You are supposed to love Him with all your heart and all your soul and all your strength and all your mind, after all! I don’t know if my mom was trying not to laugh at this point, or if she was grieved at how much I was beating myself up. I do know that she must have been at a loss of how to console a ten year old who thought she was going to hell. After trying everything she could to convince me that I did love God very much, even if I didn’t realize it…she punted. “You know,” she said, “I think there’s a verse in the Bible that says, ‘If a woman has love as small as a mustard seed, she will be saved. '” [Update: There’s not a verse in the Bible that says that]. I felt like a huge weight come off my shoulders. But I still had one question. My other great bedtime memory came after either the 4th or the 5th grade spelling bee. I had won my class spelling bee and got to compete in the school-wide bee. I really wanted to win. My best friend at the time always won everything; she was always just a little smarter than me, a little better, a little prettier. And because of that, I really had this hunger to distinguish myself. Since I was a good speller, I thought that this was my chance to do it. I will never forget the word I missed: mystify. I was shocked when it was wrong. Only when I left the stage to sit with the others who had been eliminated did it occur to me: it wasn’t like mist, it was like mystery. Mystery, Kim, not mist…mysteries, like the ones you love to read so much? People are mystified by mysteries. You. Idiot. I had learned all about the importance of being a good sport, but inside, I was crushed. Looking back, I think that was the first time I was genuinely depressed. I remember trying to pretend like it was okay, that I was taking it all in stride, but the truth was, I was so, so sad. I went to bed that night feeling that weight of sorrow. It was funny that night, because it was dad who came in and sat on the edge of my bed, his weight pulling the covers more tightly around me. We usually kissed dad before we went to bed; it was usually mom who came to our bedside to bid us goodnight. But here was my father, big and important in his stiff, dark suit, smelling like business and tobacco and cologne and the world. He cut an odd and imposing figure sitting on my pink, girly comforter, under which his 11-year old daughter lay in a heap of failure. I was all ears. It was always novel to picture my dad as a little boy. I had no doubt that my father was one of the most important, powerful men in our city, if not the world, and thinking of him as having once been a little boy almost felt like knowing a secret weakness about him. My heart was already starting to break in anticipation. Oh, no. I knew what got him. And there it was. My father, at one point, could not spell the word, women. I couldn’t help it: I laughed. But it was truly a laugh in commiseration. After all, I was in 4th grade and couldn’t spell mystify. But there was something so heartening in the fact that I was not alone in losing a spelling bee. And also, if my dad could come back from misspelling women to go on to become one of the most important men in the world…then surely there was hope for me, too. On that raft of hope, I was able to float peacefully off to dreamland. I love looking back on those moments. In those special times, my parents were the Dragon Slayers, vanquishing fear and sorrow from my wounded soul. I see now, though, that these rescues were simply the natural outgrowth of the time they put into every night to make sure that all was well with my brother and me. They worked hard to keep us in a world full of love, peace, and joy, and that work was accomplished both through the normal routine of stories and kisses and through those rare crises. And now, I get to build that sanctuary for my children. I get to use the sacred routines of baths and stories, devos and prayers, kisses and whispers to create a layer of peace between them and the natural stressors of their young lives. Being a child is tough sometimes. My son’s dread of dealing with his grumpy art teacher is every bit as real and unsettling as the stresses in my life. And that is where our happy bedtimes benefit both my children and myself. It is a chance for all of us to let go of the failures and frustrations of the day, as well as all of the worries of tomorrow, and just remember how much we love each other. All of the hugs and kisses and giggles and whispers remind us that life is good, even though it is not without its daily hurts and inconveniences. And I have found, interestingly, that when I speak peace into my son’s troubled soul, the anxious child within me hears and is quieted, also. We might be worried about different things, none of which are truly resolvable in the moment, but our soothing talks remind us that we are both loved, we are both blessed beyond measure, and we both always have people to come home to, people who absolutely adore us. In that way, our happy bedtimes help to create a secure and peaceful world for both of us. 28 responses to this post. Thank you! I also loved your post on reading aloud to your children. Great thoughts! What a lovely post. How beautiful that your children will only have joyful associations with night time! I find that my daughter Ramona is at her most playful just before bed time and if I take enough care to play actively with her and then enough time for calming down we both snuggle down together in a cloud of “life is good” ness! “A cloud of ‘life is good’ ness.” Love it! My kids sometimes have a lot of energy right before bed, also. Thankfully, they expend a lot of it by being loud and silly in the bath. Then, we can usually get the rest out via tickles:). You gave us two lines that really capture the whole idea for me, Kim. Our son and daughter both in college now. When they’re home for a weekend or on break they still like to talk to us at bedtime (especially our son), only now it’s our bedtime and they’re the ones who linger in our room (sometimes as I struggle not to fall asleep in the middle of eharing whatever is on their mind). Special times. “I figured when our kids were little that they had enough going on in life that they did not need to feel beat up by what happened at bedtime too.” Amen! My husband and I agree completely. I love hearing from people who are a bit further along in parenting, and I especially loved the image of the tables being turned when they come home from college. That is so sweet! And I love the image of entering sleep gently with no sadness. Beautiful! I love that your bedtime practice isn’t about the “how-to’s” so much as the heart of bedtime – something any parent can put into practice. Thanks! I actually started to write out our routines, but then I realized that the specifics weren’t really the point. Thanks for your kind words! So beautiful. I love this one. Thank you! Thanks for giving us this opportunity, Sarah! It’s been so fun to get to read everyone’s practices! So beautiful! And don’t we all need those sacred routines to allow peace to arise! Thank you so much for this beautiful reminder! Thanks for stopping by, and for your encouraging words! It works both ways, too. I came home really sad tonight, having learned that a friend lost her struggle to breast cancer today. I spent extra extra extra minutes tickling my boy and reading bonus chapters to my girls and *their* bedtime brought *me* the peace I needed tonight. A layer of peace, you called it. A layer of love. Robin–exactly! I have found that to be one of the unexpected results of our bedtime routine: it gives me that layer of peace/love, also. Funny how that works. I’m so sorry about your friend. This is AWESOME! This is exactly the antidote I need for my dread of “making” my kids go to bed. We’re still in the throes of toddler hood, so bedtime is pretty intense for both my kids,but if i could use it as an opportunity to connect *with a purpose* at night (instead of trying to endure one more obstacle before I get my ‘selfish’ time) I could be a much, much better parent for those long minutes (hours). Oh, yes–the throes of toddler hood. I remember them well (since they were not so long ago:)). When my son was about two, especially, bedtime was a battle. Ironically, it’s because it was so tough that we started building elaborate routines around it, to ease him into it. Three years later, we are so blessed by those routines. It’s interesting how battles can end up being blessings in the long run. By the way, I totally understand the almost desperate desire for ‘me’ time in the evenings. It can be so hard to be purposeful despite that desire, and my hat goes off to you for seeking to do so. Good stuff! This is great! We’re just starting to think through bedtime routines with our five month old (who is currently lying beside me chewing on a toy kangaroo and vigorously resisting sleep). Ha! I have so been there Looking back, it was ludicrous the things we did (and HOURS we put in) to getting our first child to go to sleep as an infant:). Our routines have evolved with our children, but when they were babies, we definitely spent a lot more time rocking (or bouncing on an exercise ball–don’t ask) and singing. Now that they’re a little older, I look back and miss those parts…but I do love getting more sleep:). Hope you and your five month old got some rest tonight! Oh yes. Bedtime is such a sweet time of redemption and bonding here. There are nights when I put the younger one to sleep and I just want to go sit on the couch and have a warm drink and rest after the long day, but I point my feet towards the older one’s door where he is invariably still awake, waiting for me to come snuggle with him. And it is always worth it. Every time. Thank you for sharing these beautiful words of yours. Thank you, Cynthia, for stopping by. I understand your temptation all too well, and like you, I can vouch that it is always worth it to put those extra few minutes in! Beautiful words. As I live in the deep tiredness of life with a newborn, I find myself both struggling to provide and needing that special time at the end of the day with my girls. I have days when all I can do is hand them to their dad in hopes that he can provide peace where I only find frustration. The other days, though, those last few moments of my girls’ day often are the special time we need to know we are all okay. Thanks for speaking to my heart as always – God always seems to give you the topic and the words to encourage me on my journey! Love you, Molly. Those newborn days are rough! I’m keeping your wonderful family in my thoughts and prayers, as always. We miss you guys! Thanks, Sarah. I can definitely relate to feeling “overly protective” yet “confused about how to help.” Being a parent can be overwhelming sometimes. I will pray that God gives you clarity and wisdom as you raise your precious daughter. This is exactly right. Beautiful, thank you.